Merrick Garland is not at the Inauguration as a SCOTUS Justice. It is a disgrace. 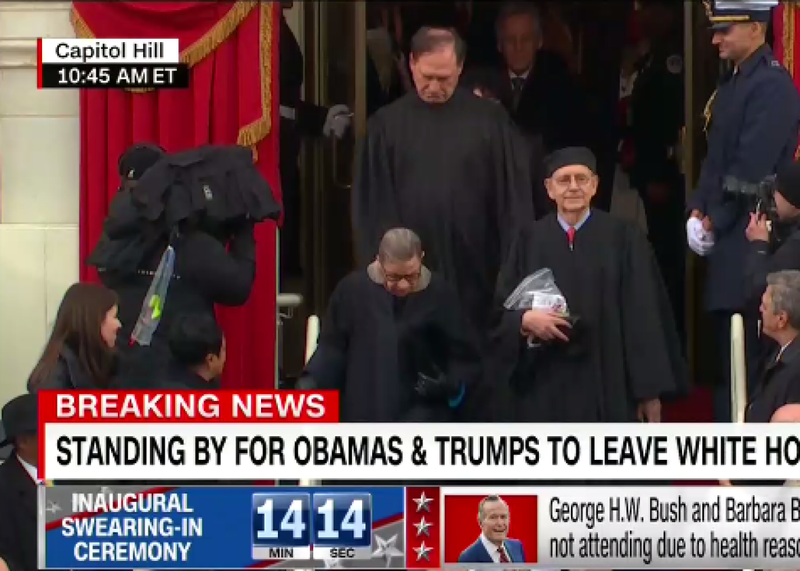 Supreme Court justices arrive at the inauguration. Not pictured, Merrick Garland. On Friday, all eight Supreme Court justices were seen in attendance at the inauguration of Donald Trump. Not pictured was Judge Merrick Garland. Garland was nominated 310 days ago by President Barack Obama to be the ninth Supreme Court Justice. In an entirely unprecedented act of gamesmanship and political obstruction, Senate Republicans refused to even offer Garland a hearing. Now Trump will get to nominate whomever he wants to fill this seat. Trump lost the popular vote to Hillary Clinton by nearly 3 million votes, or 2 percent. More people have voted for Democratic senators than Republican senators since 2012, but Republicans control that body and have the ability to choose to blockade or vote for whichever Supreme Court nominations they want. On Wednesday, Judge Merrick Garland returned to his job as chief judge of the District of Columbia Circuit, where he had served for years as an uncontroversial moderate known for his professionalism and his extraordinary judicial qualifications. He is 64.